Last month, the Pacific Institute released an analysis of the California water bond — informing voters of the ins and outs of Proposition 1 before they hit the polls. That analysis highlighted the key provisions and potential impacts of the now newly-passed Proposition 1. Now that voters have passed the bond, the Institute has published a commentary on the key issues to watch for as the money gets allocated and spent. Our work concludes that though the bond will not help the current drought, it is a down payment to fund better water institutions, planning, and management strategies. Find the Institute’s analysis of the next stage for the $7.5 billion water bond here. Find the executive summary and full report of our analyses here. 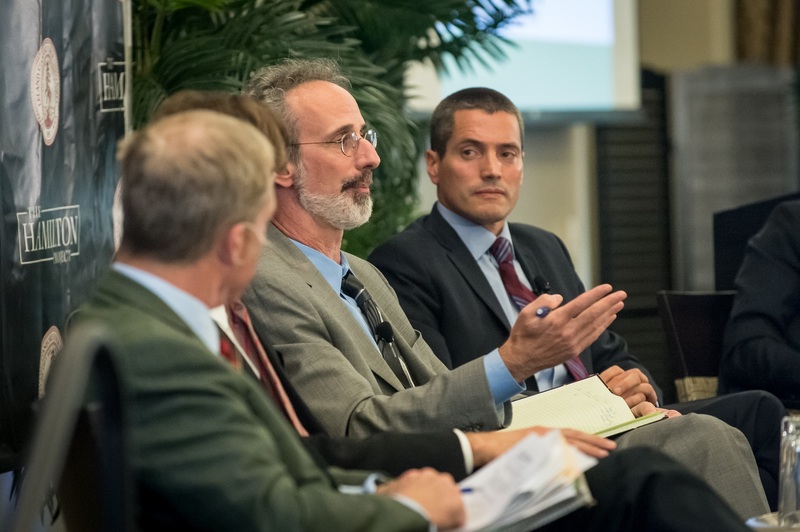 On October 20, Peter Gleick and other experts spoke at the “New Directions for U.S. Policy Conference” hosted by the Stanford Woods Institute for the Environment and the Hamilton Project. Peter spoke on the impacts of climate change on water in the United States. Gov. Jerry Brown also attended this conference, where he remarked on the crucial importance of water in the West. Find more materials from the event here. The California Department of Water Resources released the 2013 update of the California Water Plan — a comprehensive, strategic plan for managing and developing water resources within the state. The Pacific Institute, as well as many other stakeholder and government agencies, was involved in the collaboration of this multi-volume report. Volume 1 of the California Water Plan features research from Pacific Institute staff. Citing many of the Institute’s prior works, the first volume covers the strategic plan for improving California water as it is today. In addition, chapter five highlights a new Institute analysis on California’s water footprint — a measure of the total volume of freshwater that is used to produce the goods and services consumed by Californians.This assessment provides valuable information on the state’s use and management its water resources, as well as addressing issues regarding sustainability. Find the complete California Water Plan here. Jason Morrison, the Pacific Institute’s director of the Corporate Sustainability Program, presented the Water Action Hub to the Mississippi River/Gulf of Mexico Watershed Nutrient (Hypoxia) Task Force. At its semi-annual meeting in Alton, Illinois, the Hypoxia Task Force was considering using the Hub as a coordination platform for its efforts playing out at the state and federal levels, as well as an outreach vehicle to engage the private sector in its work. The UN Global Compact CEO Water Mandate Water Action Hub is the first online platform designed to unite companies, governments, NGOs, and other stakeholders on a range of critical water projects in specific river basins around the planet. Find materials from Morrison’s presentation here. 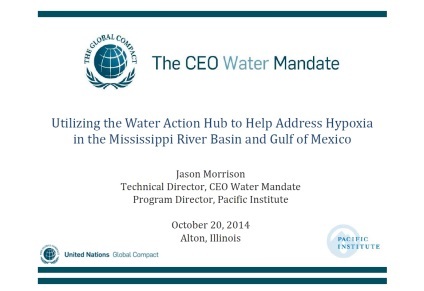 Learn more about the Water Action Hub here. In October, among the topics covered are water shortages, California’s Proposition 1, and the drought’s negative impacts on migratory birds and their habitats. Read the latest drought update. In October, Pacific Institute staff were keynote speakers at a diverse variety of forums, including the Commonwealth Club and the World Affairs Council. Staff presented the Institute’s research on the costs of inaction of the Salton Sea; water and energy efficiency; and collective action for sustainable development. Read the full list and more details here. On Wednesday, December 3, 2014 3:45-5:00 p.m., Senior Research Associate Michael Cohen will be serving on a panel at the Association of California Water Agencies 2014 Fall Conference & Exhibition in San Diego, CA. The panel, The Salton Sea: The Next Chapter, will bring together experts to talk about the strategies they are creating to improve the Salton Sea. *The New York Times draws on the Institute’s report, Hazard’s Toll: The Costs of Inaction at the Salton Sea in its November 11 article focusing on the negative impacts on wildlife as the human-made lake continues to shrink and become more saline. 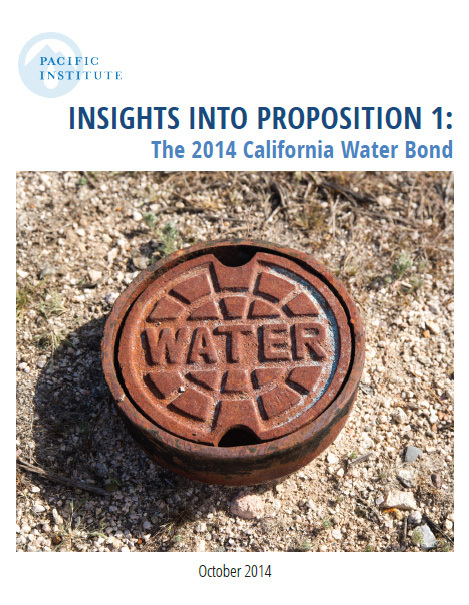 *KQED draws upon the Institute’s water bond analysisin their video story on Proposition 1. *San Francisco Chronicle highlights the Institutes new analysis on Proposition 1. .
*The Guardian:Oliver Balch interviews Peter Gleick about the increasing violence related to water conflicts. *Los Angeles Times: Peter Gleick discusses the “mega-drought” and the importance of using water resources more effectively.